Resene paint colours can be quickly and easily added to your ArchiCAD project using ArchiCAD's Attribute Manager. Once loaded the Resene paint colours will be added to your ArchiCAD project file and can be applied to any wall, floor, beam or object etc - an ideal way to show your clients how selected Resene paint colours will affect the look of their project. The Resene BIM ArchiCAD paint colours are available as a free download from this website. 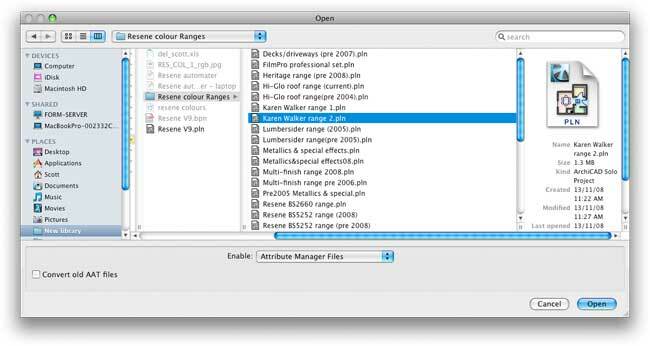 The colour range files are both Mac and PC compatible and work with ArchiCAD 9 or later. They can also be back saved to work with ArchiCAD 8.1. The BIM Resene Colour range files for ArchiCAD allow you to quickly and easily use Resene's vast colour range in your ArchiCAD projects. You can quickly test different colour schemes and provide your clients with more realistic visualisations. 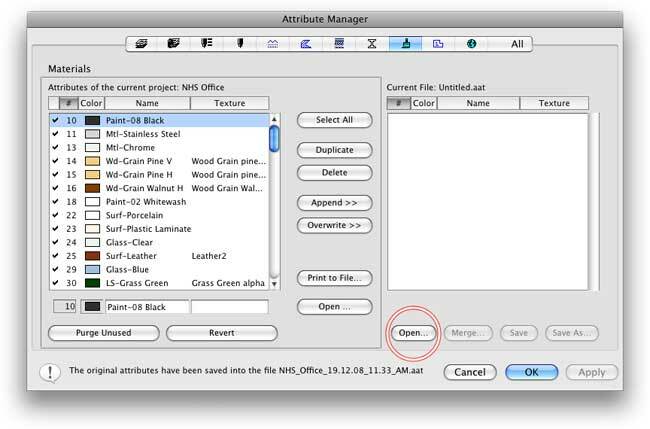 These colour files require ArchiCAD 9 or higher and work on both Macs and PCs. All of the colours have been made into ArchiCAD materials and have also been optimised for use with the Lightworks rendering engine. 1. Open the Attribute Manager within your project and select the materials tab. 2. Press "Open" and browse to the Resene paint colour file you would like to load. Press "Open". 3. Select the colours you would like to add and press "Append". Add as many colours as you like. You can also open other Resene paint colour files to load colours from different ranges. When you have finished adding the additional colours press "OK". 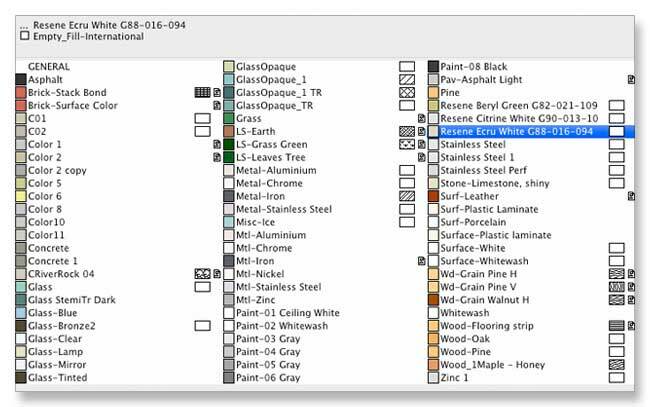 The Resene paint colours you selected have now been added to your ArchiCAD project's materials menu and can now easily be applied to walls, slabs, roofs, objects etc. throughout your project. You can add more paint colours at any time by simply going back to your Attribute manager. › View instructions as a pdf. PC: To download the file you wish to use, please right click on the file name, choose "Save link as", choose a destination folder, and click "OK". 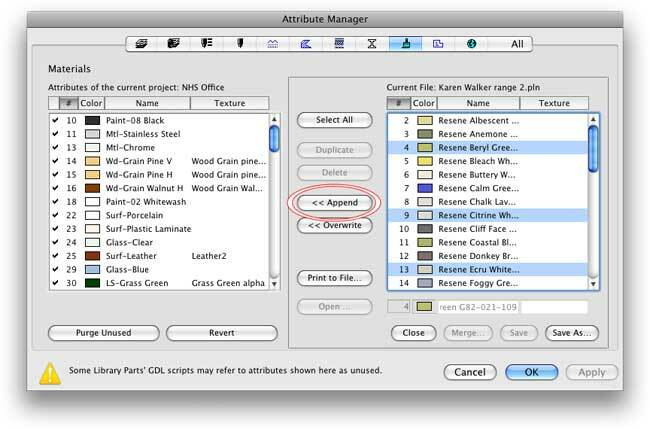 Mac: To download the file you wish to use, please hold down "Control" and click on the file name, choose "Save link as", choose a destination folder, select "All files" in the 'Save as' field of the dialogue box and click "Save".